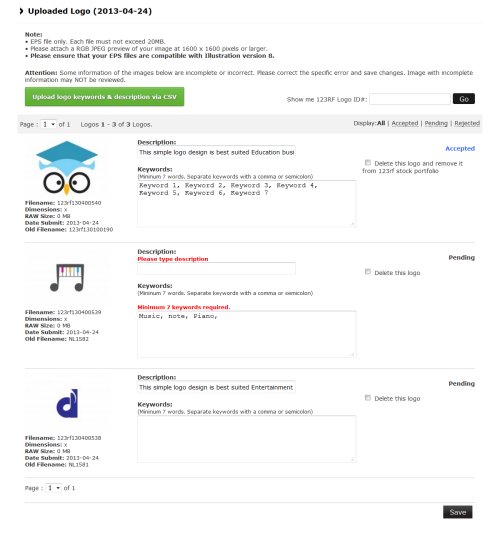 Contributors can always go to the Upload History page to check the status – pending, accepted or rejected reason of your uploaded content (RF images, Illustration, ED images, Footage, Audio & Exclusive Logo). You can also go to this page to check your pending images folder and make sure that your images have their appropriate Description and Keywords. In addition, you can select the image which you wish to delete on this page as well. Click ‘History’ to start checking your uploaded content history status. You will be taken to an internal page that shows you the total content of all your uploaded. And you will see your latest Uploads for the month. 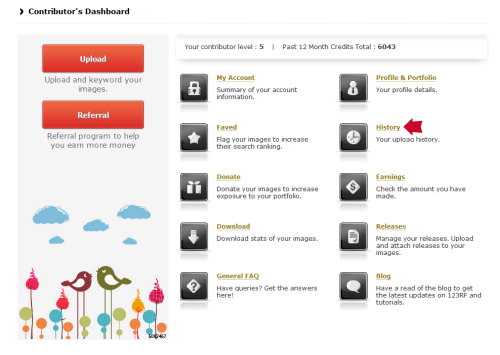 Click on ‘View stats’ of whichever month/year your content was submitted to view your submission statistics. 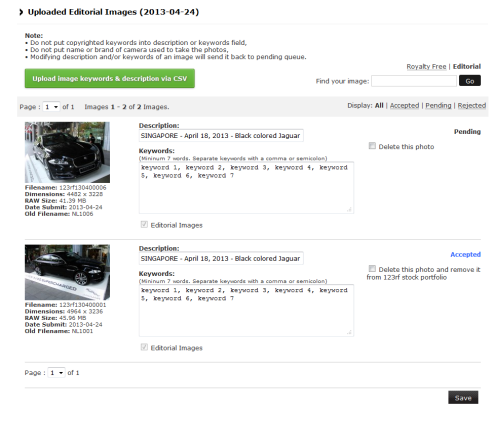 Click in to Royalty Free images upload history, you are able to view all RF reviewed images & vector status. Vector file shows Accepted status. ‘Sun shining against orange sky’ image was Accepted as standard RF content in 123RF. Pending status shows that the image has not been reviewed. ‘Close-up keyboard keys’ image shows that it was Rejected due to potential copyright issue. The last image shows that it was Rejected as Standard (RF) content BUT Accepted as Editorial content. * Check ‘Editorial’ box to consider for inclusion of image into our Editorial content if rejected from standard RF content. 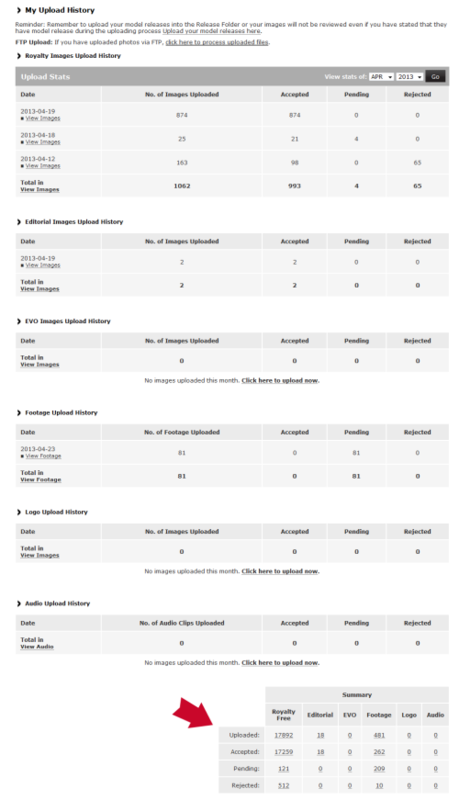 Click in to Editorial images upload history, you are able to view all ED reviewed images’ status. 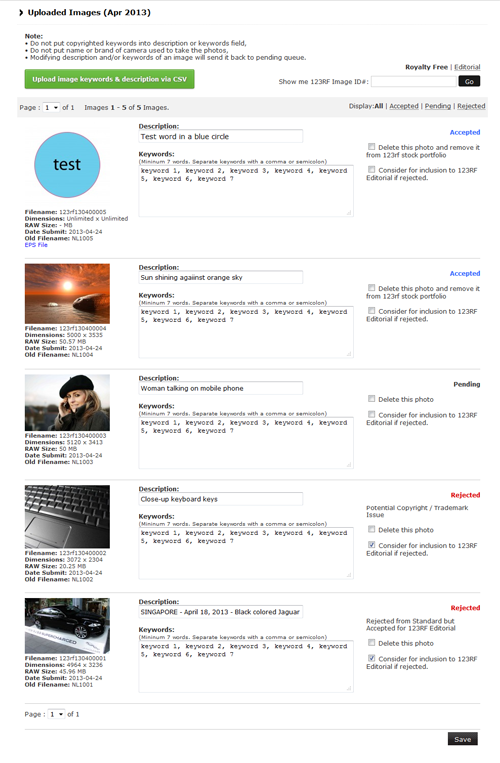 The first image shows Pending means that the image has not been reviewed. Second image shows Accepted status in ED category. When you click into Footage uploaded history, it will show a different layout from images uploaded history. The footage with completed description & keywords is shown as Accepted. Click in to Logo upload history, you are able to view all logos reviewed status. The first logo vector shows Accepted status. The 2 logo vectors without complete description & keywords are still showing as Pending review status. First audio in Pending status shows that the audio has not been reviewed. 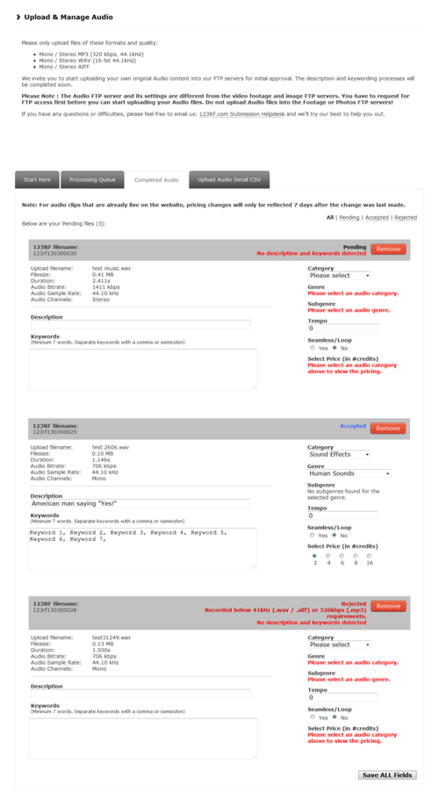 Second audio showing Accepted status with completed description & keywords. The last audio shows that it was Rejected due to recorded below filesize requirements. * If you wish to delete your content, please refer to Deleting Uploaded Content for more information.